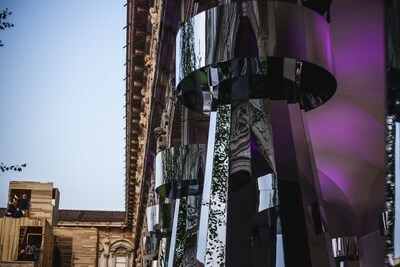 MILAN and WARSAW, Poland, April 12, 2019 /PRNewswire/ -- The glass works of art of the KROSNO brand and the SAKRED collection, created in cooperation with Karim Rashid, were presented at Fuorisalone 2019 in Milan. As part of the HUMAN SPACES exhibition organized by Interni Magazine, the installation inspired by KROSNO glass and designed by Mariusz Miękoś and Dorota Koziara will be presented in the spaces of Università Statale, Ca'Grande until 19th April. The opening of the installation was attended by Karim Rashid, world-famous designer and author of the first collection for KROSNO D'SIGN. Polish glass icon KROSNO shines bright in Milan Exposition “Sacred Geometry” within the framework of Fuorisalone. The KROSNO GLASS exhibition in Milan is a story about glass, which is an inseparable element of human everyday life. The main theme of the event is Human Spaces - objects or spaces present in human life and contributing to the well-being of their owners. 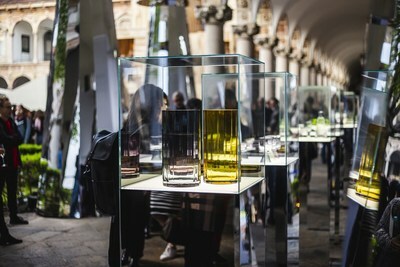 The KROSNO exhibition of glass works of art is presented in the historic, 15th-century spaces of the University of Milan and will last until 19th April. The installation "Sacred Geometry" by Mariusz Miękoś refers to the glass construction of the cone known from the Sakred collection and was developed with the utmost care to fit into the style of beautiful and historic university spaces. The opening of the first KROSNO glass exhibition in Milan is not only a presentation of the most important and never before shown products of the Polish glassworks, but also a reveal of the prestigious SAKRED collection by KROSNO D'SIGN. Its author is world-famous designer Karim Rashid, who refers in his projects to three foundations of sacred geometry: circle, line and triangle, energy, relation and balance. KROSNO D'SIGN is a brand that combines not only the exceptional quality of KROSNO products, but also unique design that meets the tastes of lovers of exceptional interiors. As the author says about the Krosno glass collection, SAKRED is a pure geometry of the cylinder and cone, the most universal forms of the world, the simplest and timeless shapes concealing the soul. The various combinations of these colourful forms give everyday life a sense of strength, stability and purity. The installation "Sacred Geometry" inspired by the SAKRED collection was created by Mariusz Miękoś, an architect. The exhibition, where you can see glass works of art from the resources of KROSNO glassworks, is the work of Dorota Koziara, a designer known in Poland and abroad. Dorota is one of the designers who started cooperation with KROSNO D'SIGN brand. KROSNO is a synonym of top quality since 1923. It is one of the largest manufacturers of household glass products in Poland, and an esteemed supplier to over 60 global markets. The KROSNO brand represents a wide range of products that stand out with their functionality, the quality of craftsmanship and timeless design. KROSNO is famous in international markets for its flagship traditional manual glass-forming technology. However, customers also value glass products formed mechanically, whose quality is excellent and which are offered at competitive prices. For businesses around the world, KROSNO creates custom-made products, offering a full range of services, from design to the end product. KROSNO products are manufactured at the Krosno Glass glassworks, located in south-eastern Poland. The plant has efficient production lines that allow to form glass mechanically. The company prides on its impressive furnaces with infrastructure designed for melting and forming the most beautiful glass products, hand-made by artist-smelters.